If you’re a digital artist searching for the perfect Procreate brush to craft stunning illustrations or to design unique website header images, we’ve got a great collection of professional Procreate brushes just for you. Procreate is amongst the most popular drawing apps available for iPad Pro. It’s actually more than just a simple drawing app. With the Apple Pencil stylus and the right set of brushes, this app can help you craft amazing digital drawings and paintings. 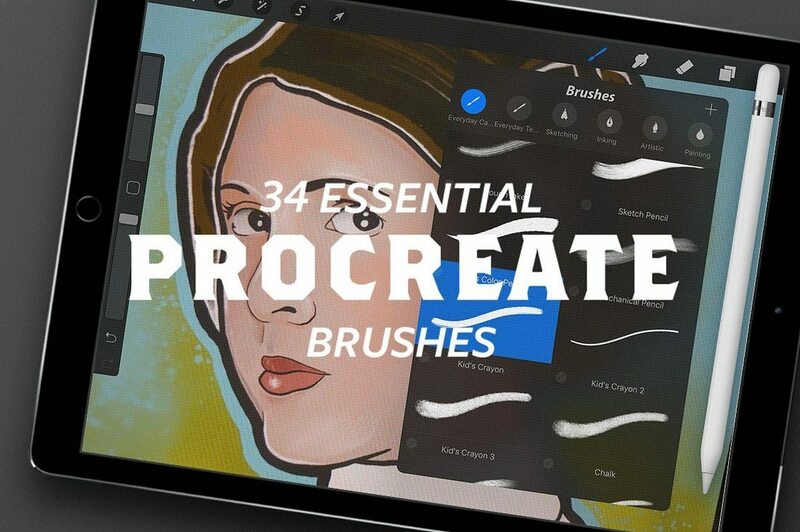 The app comes with over 130 basic brushes. But, many people don’t realize that they can expand this collection with custom brushes that have been carefully created by professionals. 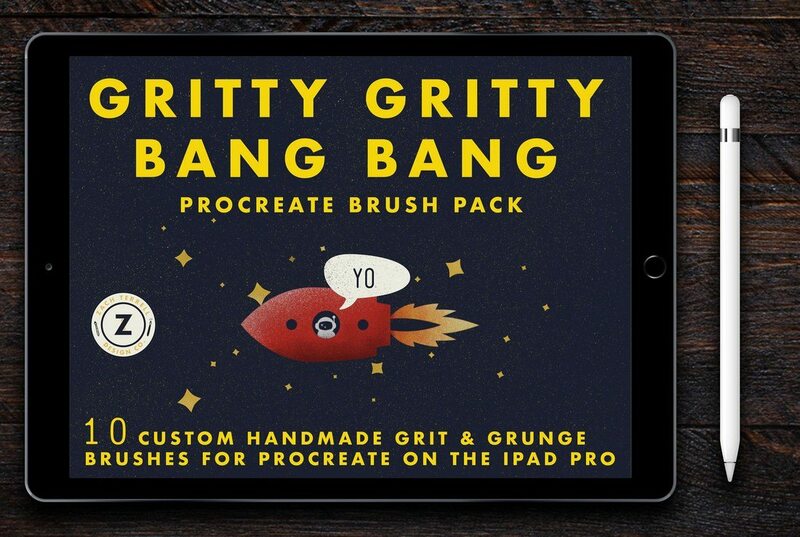 We’ve handpicked some of the best custom brushes you can use with your Procreate app. Have a look and make your pick. The word mega doesn’t serve enough justice for this massive brush back. 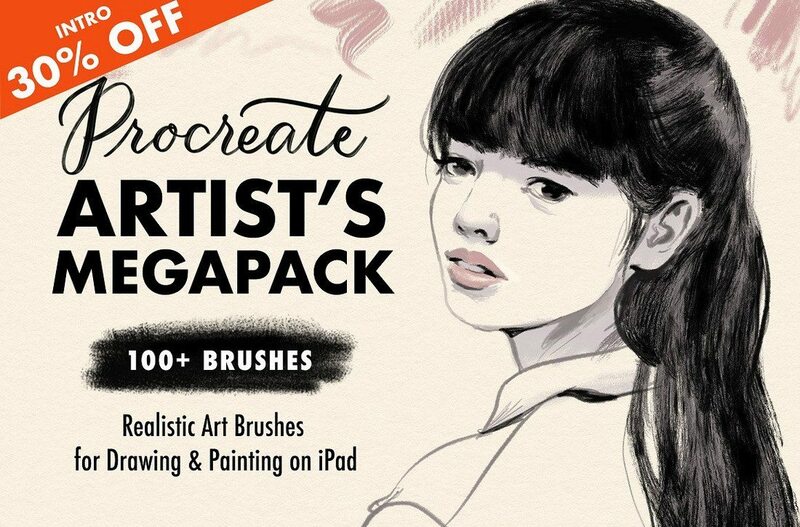 With over 350 great Procreate brushes, this mega pack comes to your at the price of one. It includes a whole set of different kinds of brushes including ink brushes, sketch, pencil, manga and anime brushes, and much more. This Procreate brush pack is all about texture. It includes 115 texture brushes for Procreate, featuring 25 distressed halftone brushes, 27 distressed print brushes, and 62 distressed pattern brushes. They are ideal for drawing retro and vintage artworks. Working on a header image for a website? A cover photo for a social media profile? Or brand signage? 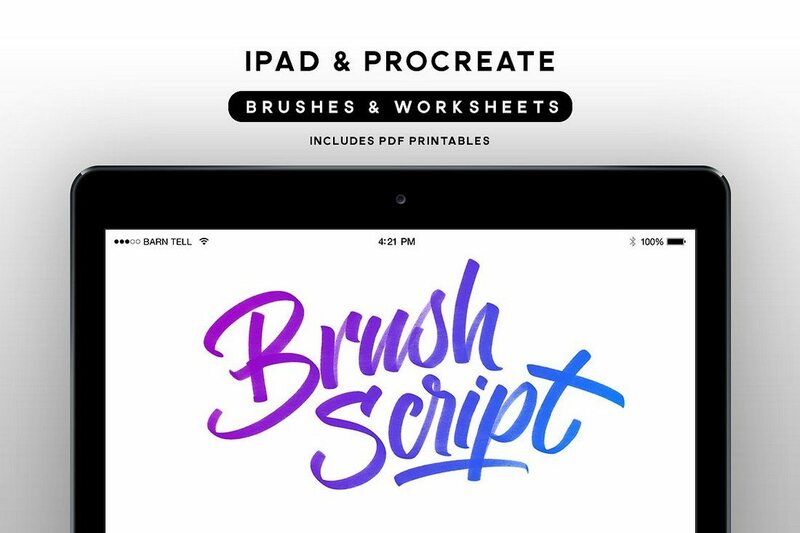 The brush script style brushes in this bundle will help you create unique calligraphy art using Procreate. The bundle includes 10 unique brushes and 10 worksheets that will help you practice creating calligraphy. 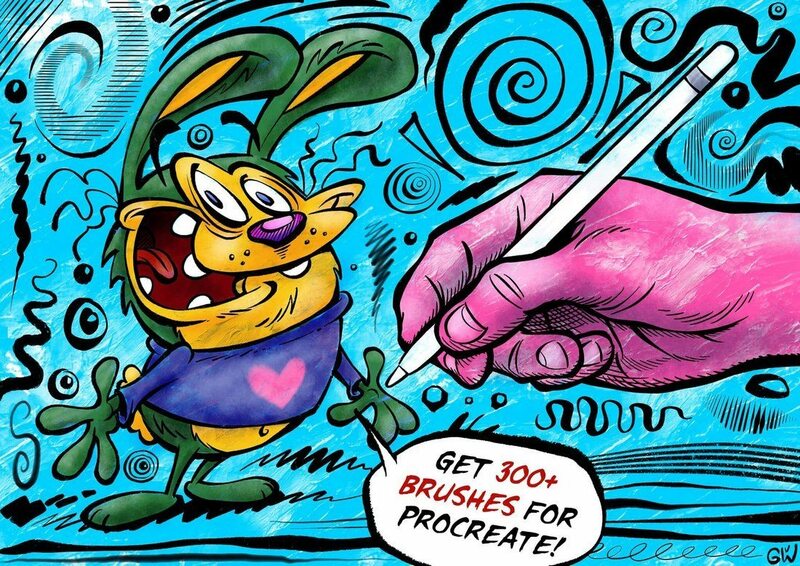 This 3-in1 bundle of Procreate brushes comes with ink, pen, and sketch style brushes that are perfect for creating different types of drawings, including sketches, characters, doodles, comic strips, and more. The bundle features over 40 ink brushes for comics and cartoon drawings, 19 ink brush pens for shading and paint, 25 Japanese ink and paint brushes, and 8 custom pencil and sketch brushes. Another unique pack of handmade Procreate brushes that come in 3 different sets: Regular brushes, ink washes, and ink stain stamps. All of which has been created based on Japanese ink samples. These brushes are ideal for creating old and vintage style drawings. This Procreate brush pack is made just for creating beautiful watercolor based backgrounds and drawings. You can also use them to paint and color your drawings. The pack includes 45 unique watercolor washes, textures, edges, effects, stains, and much more. 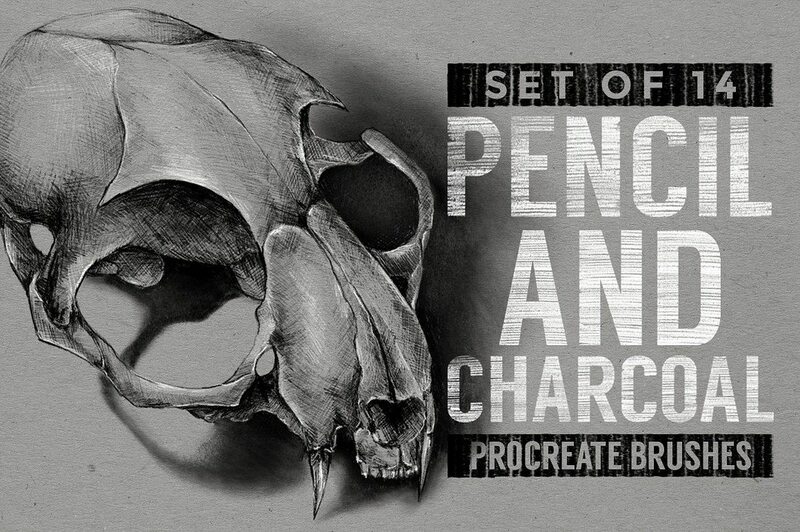 A set of Procreate pencil and charcoal brushes for making your drawings look like professional sketches and artworks. The pack includes 14 unique brushes you can use to draw sketches and comics. Halftone is a technique widely used in comic books and vintage style illustrations. This brush pack brings that same style to Procreate. 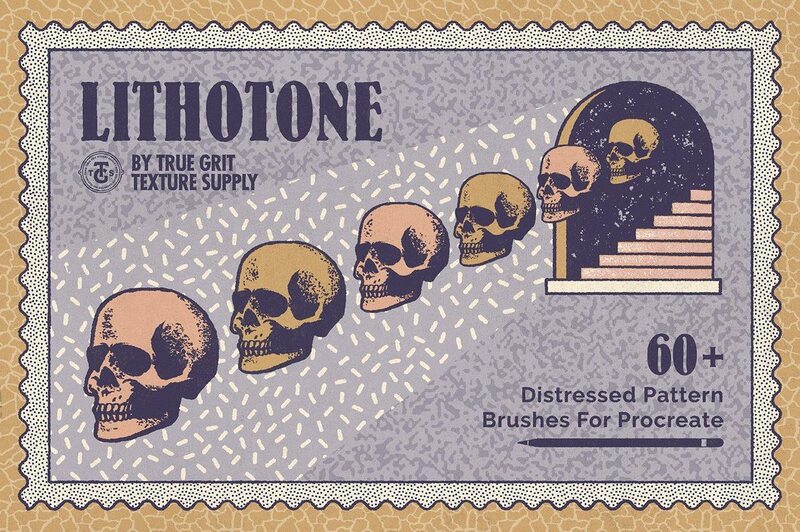 Using these brushes you can create illustrations and sketches using the halftone technique. 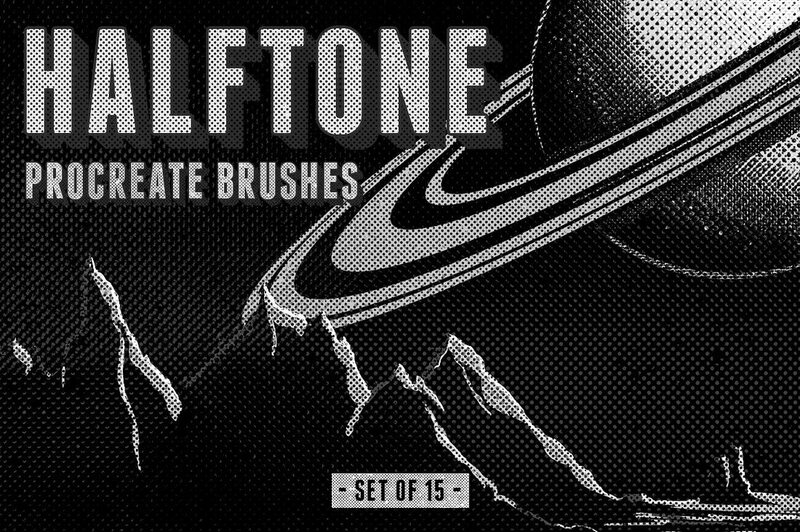 It comes with 15 handmade halftone brushes along with 2 linework brushes. Another pack of texture brushes for adding more depth and quality to your grunge and grit style illustrations. 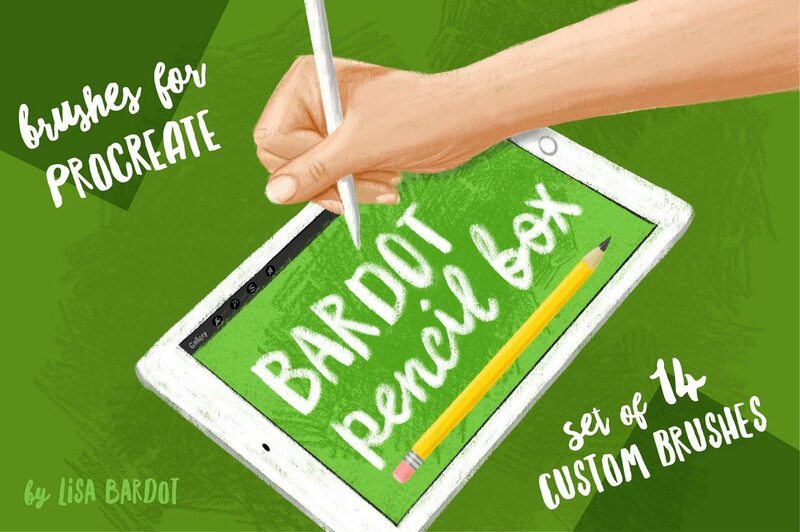 This pack includes 10 custom Procreate brushes you can use with your various artworks and projects. Add a little bit of your own imagination and you’ll get more out of these brushes. 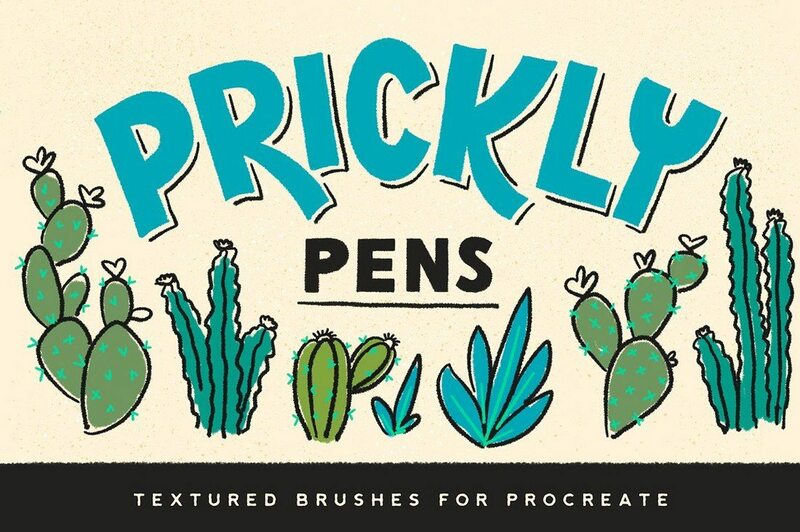 According to the designer of this Procreate brush pack, these brushes have been created to “emulate the bold, graphic, and texture-rich commercial artwork and illustrations of the 50s and 60s”. 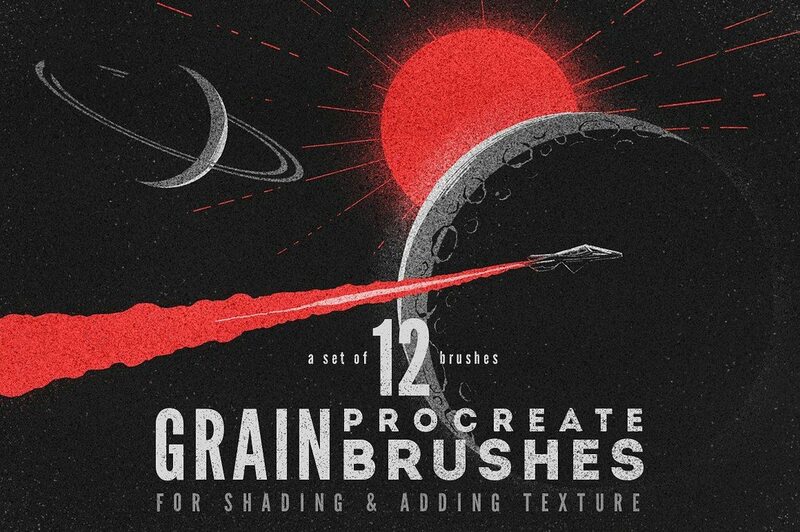 If you’re an artist who works with retro art and drawings, this brushes pack will come in handy. 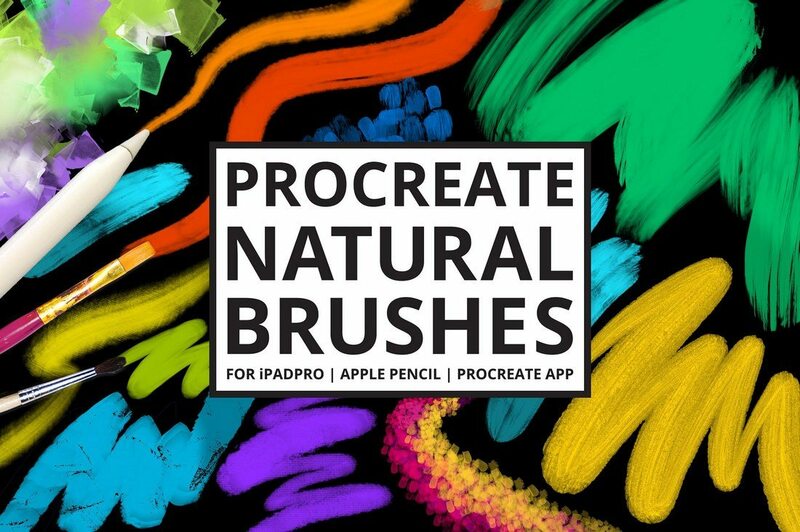 This pack of Procreate brushes is perfect for creating sketches and pencil drawings. The pack includes several types of brushes including, pencil brushes, scribble brushes, and texture brushes. You get a total of 14 premium brushes in this bundle. A unique Procreate brush pack for lettering work. 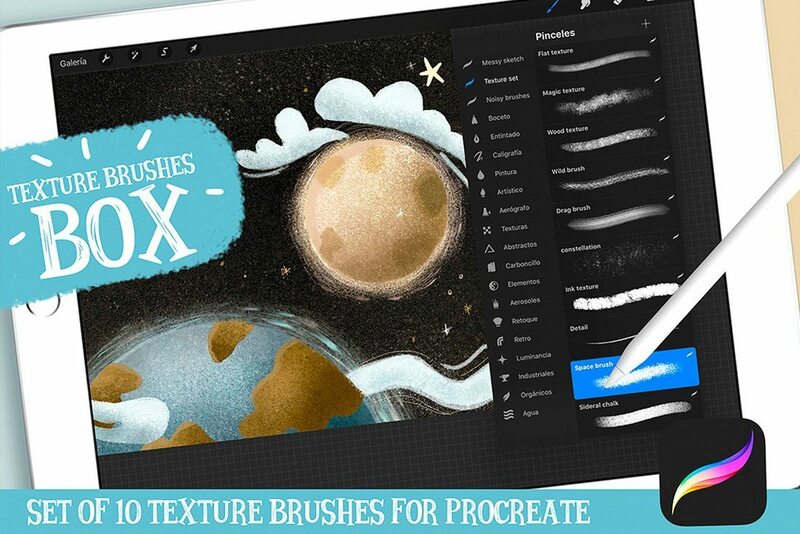 This pack comes with 20 brushes that allows you to create precise and realistic brush strokes using the Procreate app. There’s a demonstration video of the brushes on the product page. Be sure to check that out. This is a big bundle of several types of Procreate brushes. 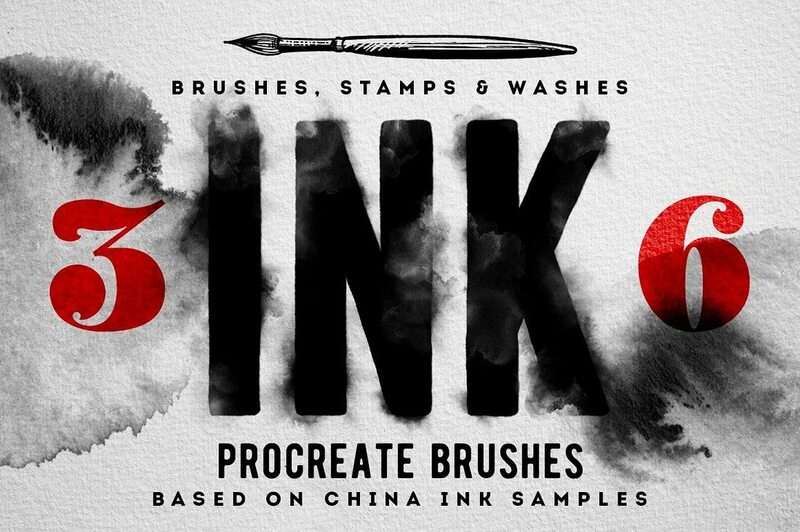 It features over 100 brushes including 41 watercolor brushes and 60 other charcoal, ink, and oil paint brushes for artists. The creator of the pack plans to add more brushes to the collection soon. Buyers will be eligible to download those updates for free. Chalk-based headers, logos, and signage is a popular trend these days. 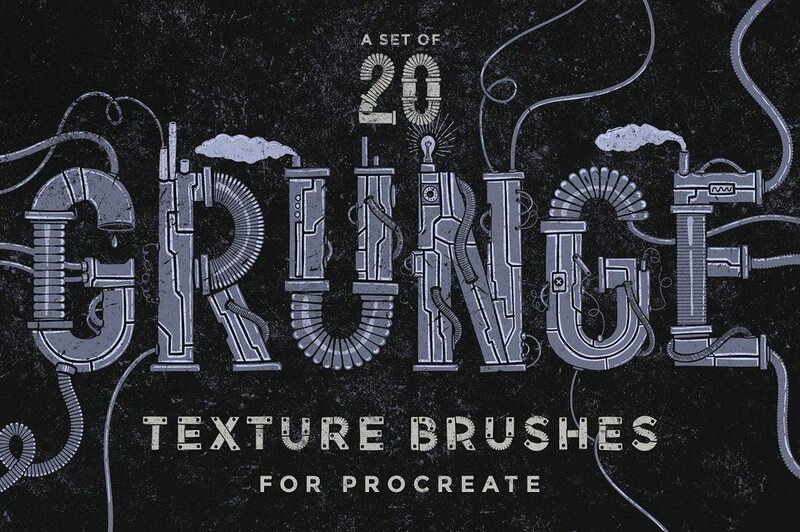 This bundle of Procreate brushes is made just for that kind of designs. 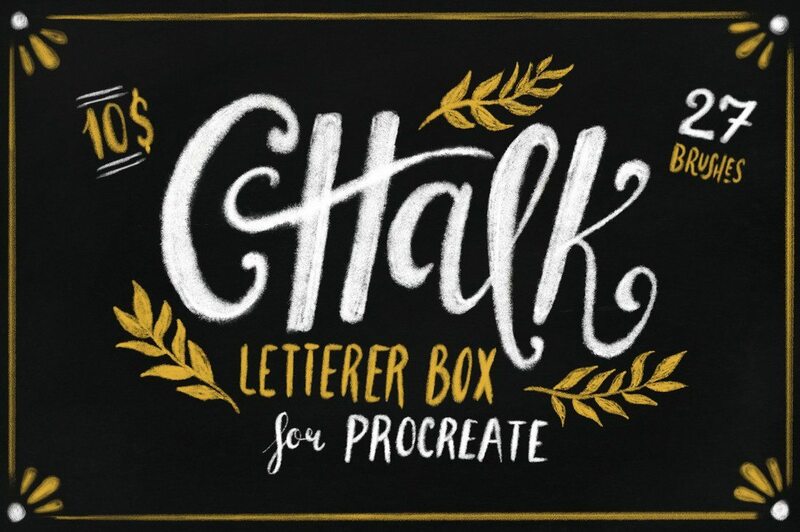 This pack includes 27 chalk brushes for creating cool lettering artworks and designs. This is a set of 10 high-quality texture brushes for Procreate created by a professional designer. It comes with several types of brushes which you can use to draw paintings, sketches, and characters with more depth and style. Shading is an important part of the drawing process. These brushes are designed to help you in that area. With over 12 Procreate brushes, you can use this pack to add more depth and shading to your drawings and illustrations. 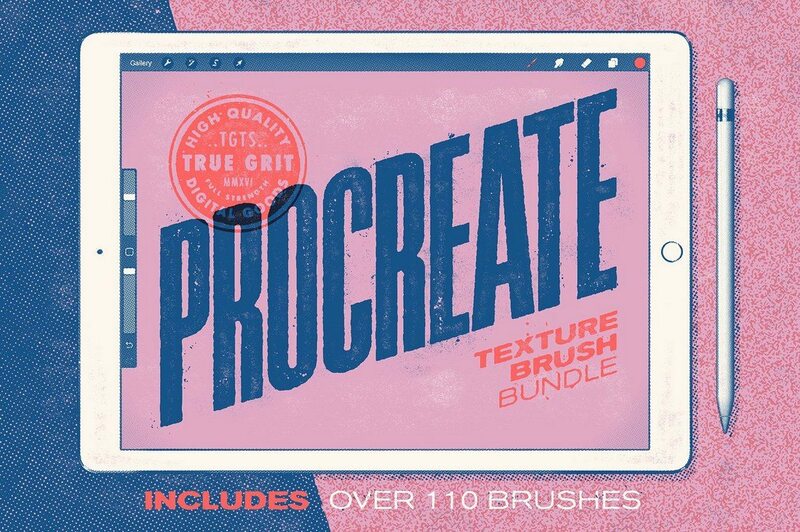 This is a pack of professional Procreate brushes that are actually being used by designers and illustrators. It includes 34 pen, pencil, crayon, and sketch brushes that have been adjusted and improved based on feedback from professional users. 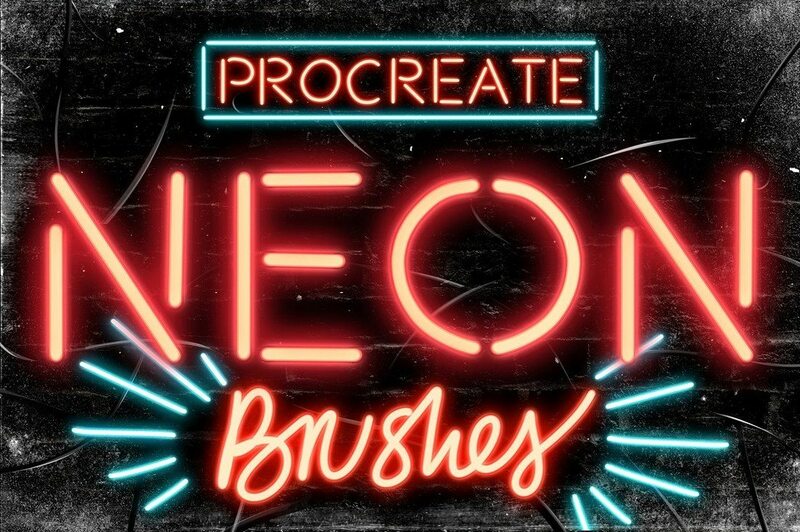 Design logos, signage and more with an old 70’s look using this pack of neon brushes. The pack includes 4 neon tube brushes, 2 grunge neon tube brushes, 1 multi-lights brush, a dot lights brush, and more. When using the brushes, you will need to tweak your art a bit to achieve that perfect neon look. Crosshatching is a popular drawing technique used by artists that involve tracing the strokes to create stylish art with deep structure, gradients, and shadows. 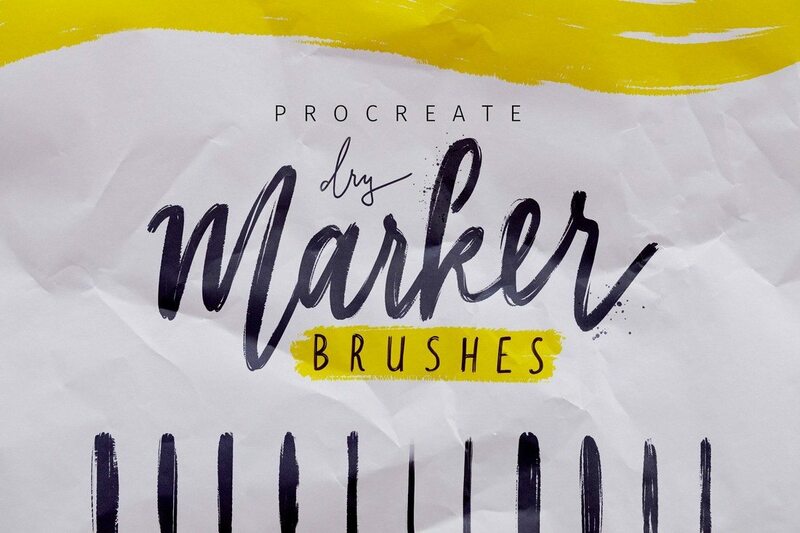 This pack of Procreate brushes is designed to help you draw with that same technique. 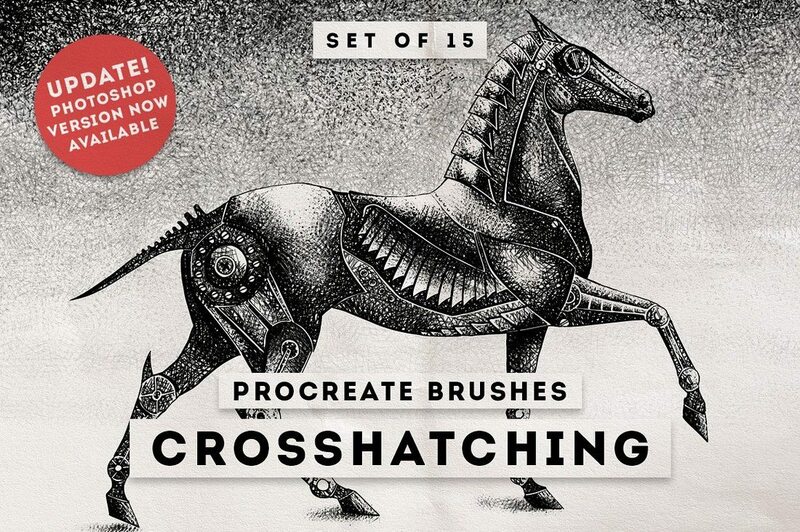 It comes with 15 crosshatching brushes. 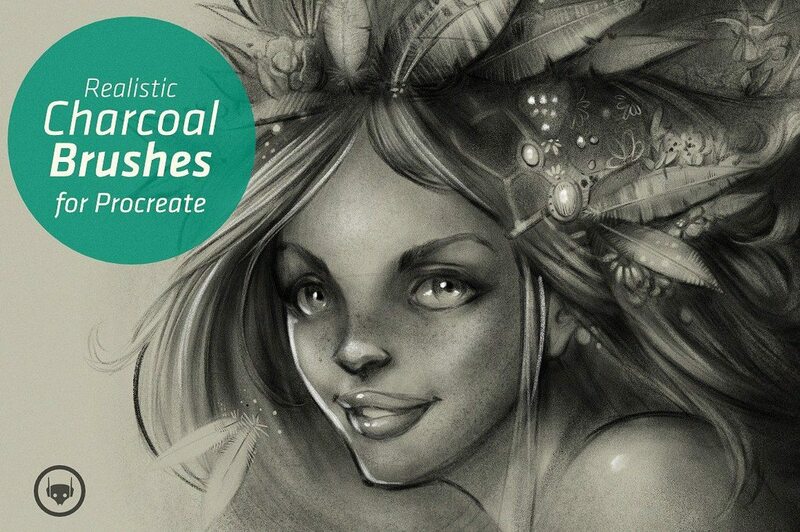 This pack includes 9 handmade charcoal and pastel brushes for drawing illustrations and sketches with a realistic look. It includes several types of brushes featuring soft, wet tip, and dust style charcoal brushes. If you’re working on a retro or a steampunk style project, this Procreate brush pack will come in handy. It includes 20 grunge Procreate brushes with various texture styles featuring dust & scratches, spray paint, paint strokes, and more. 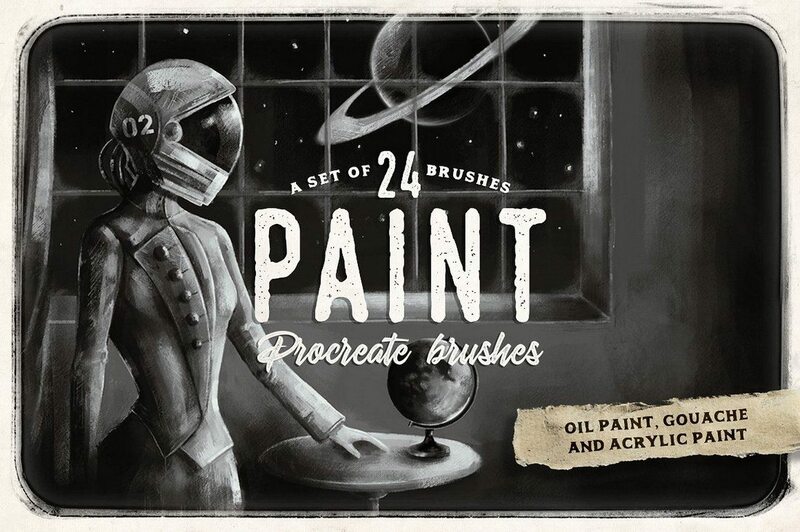 This bundle comes with 24 professionally designed paint brushes for Procreate. You can use them for drawing different types of art and illustrations. You will need Procreate 4 or better to get the most out of these brushes. This is a special brush pack that includes 9 different market style brushes. You can use these to create stylish website header images, social media posts, signage, and more. 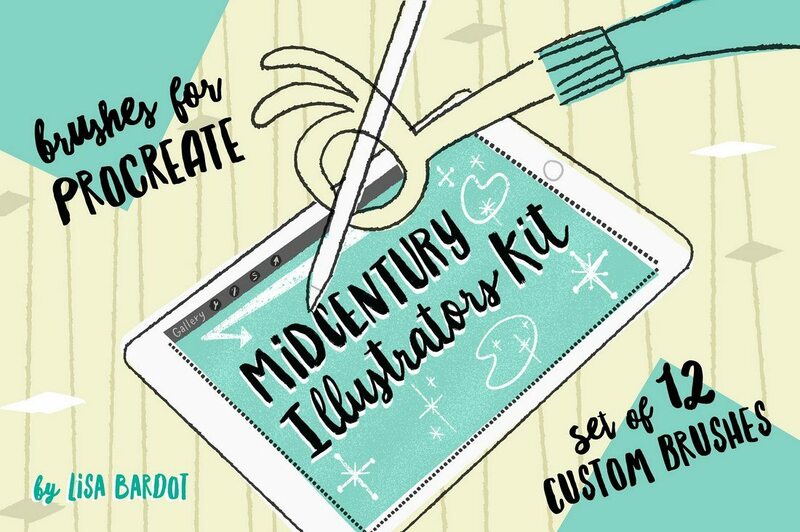 The engraving style brushes in this bundle will let you create vintage and retro style drawings and illustrations with ease. 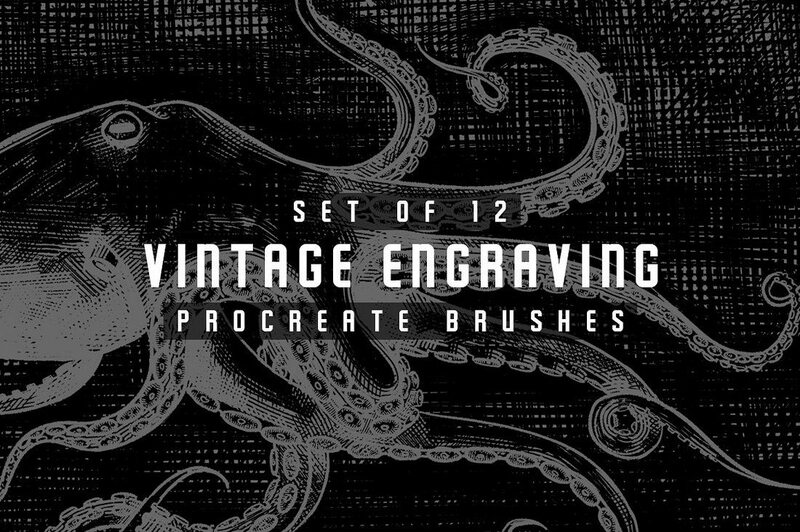 The bundle includes 12 different vintage engraving brushes. 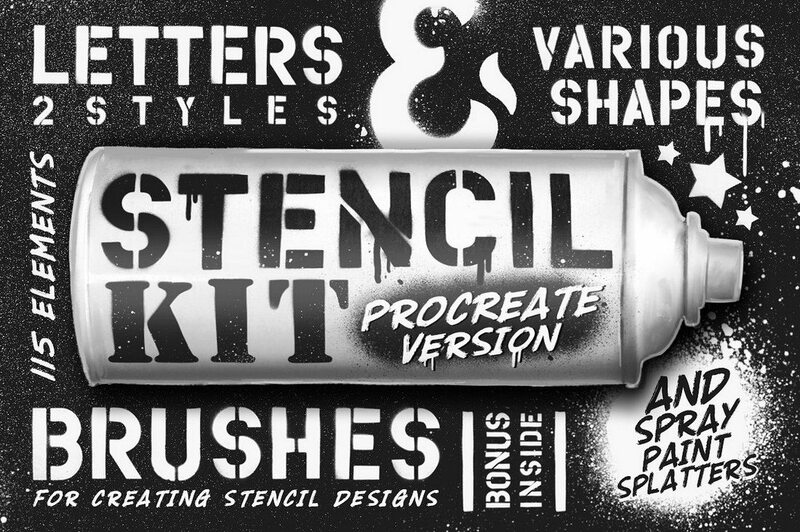 This is a cool stencil kit you can use to design stylish posters and signage using Procreate. It includes spray-painted stencil elements, numbers, alphabet, and pressure sensitive spray paint brushes. The pen brushes in this pack are ideal for adding more depth and texture to your drawings as well as for sketching. It includes 3 unique brushes with different styles. 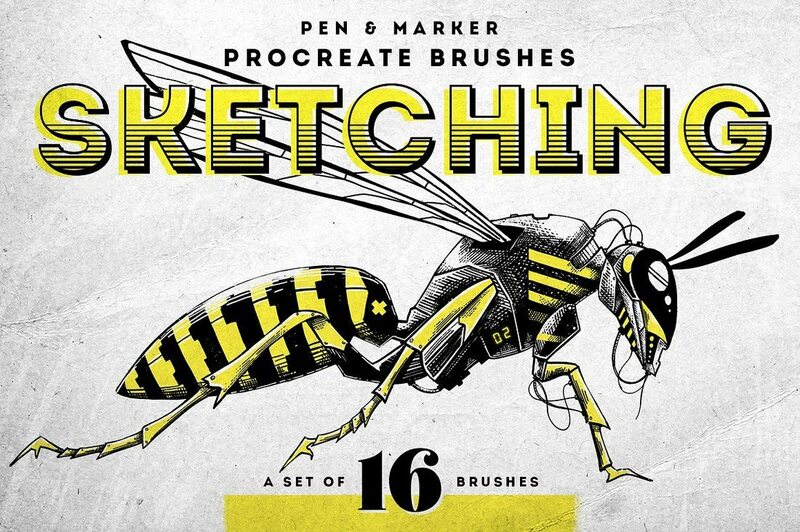 A pack of 16 Procreate brushes created specifically for sketching. 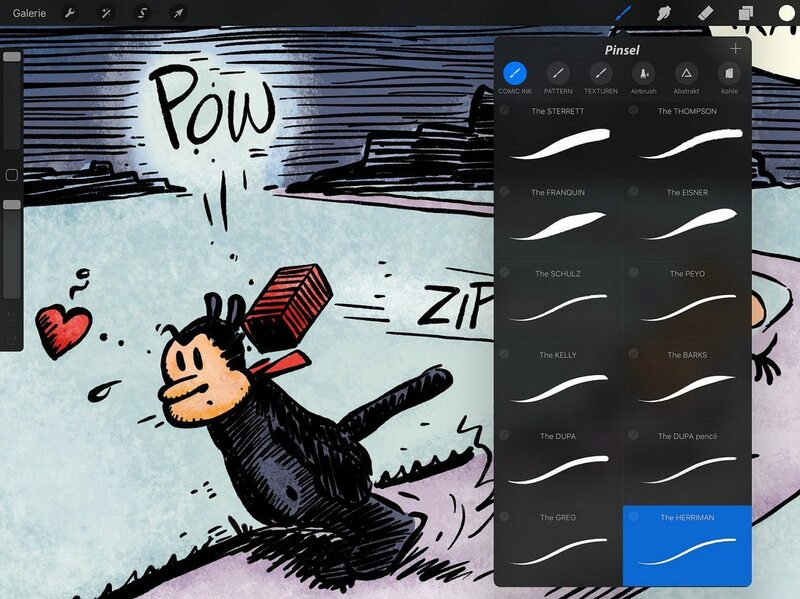 It includes 8 ink pen brushes and 8 marker brushes, which you can use to draw different types sketches using the iPad app. This bundle of Procreate brushes comes with 60 distressed brushes that allow you to draw with that unique lithotone effect. You’ll also be able to select from several styles of brush patterns as well. Sometimes, making a mess can also be beautiful. This brush pack is made just for that. 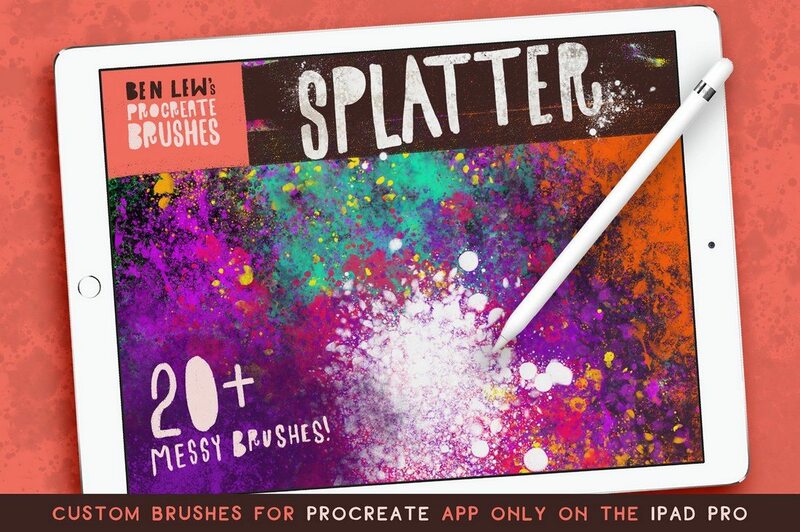 It comes with over 20 unique splatter brushes for Procreate. 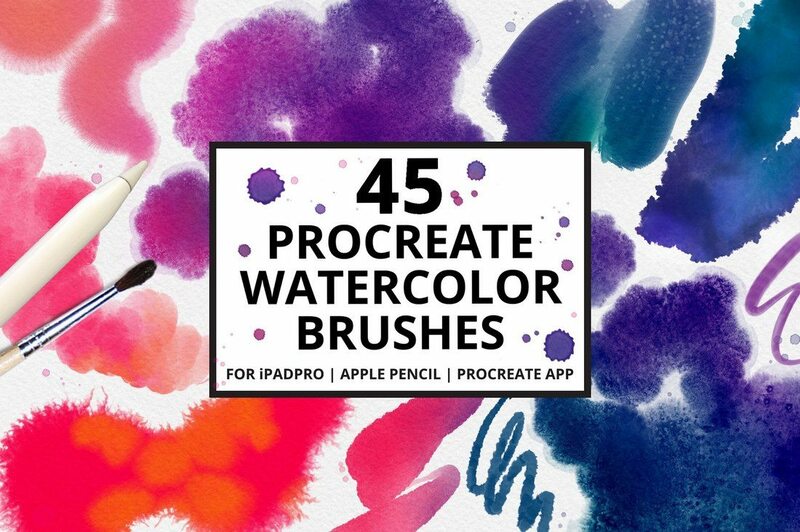 This bundle of Procreate 4 brushes comes with 30 different brush styles including bristle brushes, gouache, pastels, and much more. You will have plenty of options for drawing different types of art using these brushes. 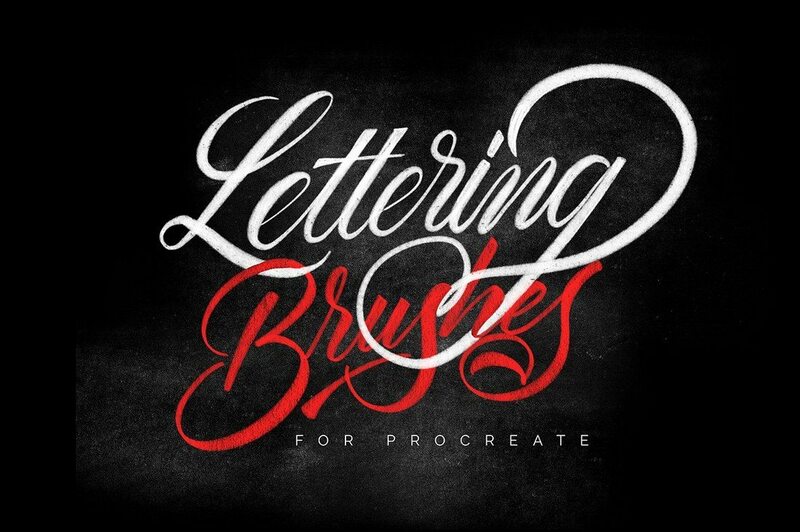 Looking for Photoshop and Illustrator brushes? Then check out our other brushes collection.